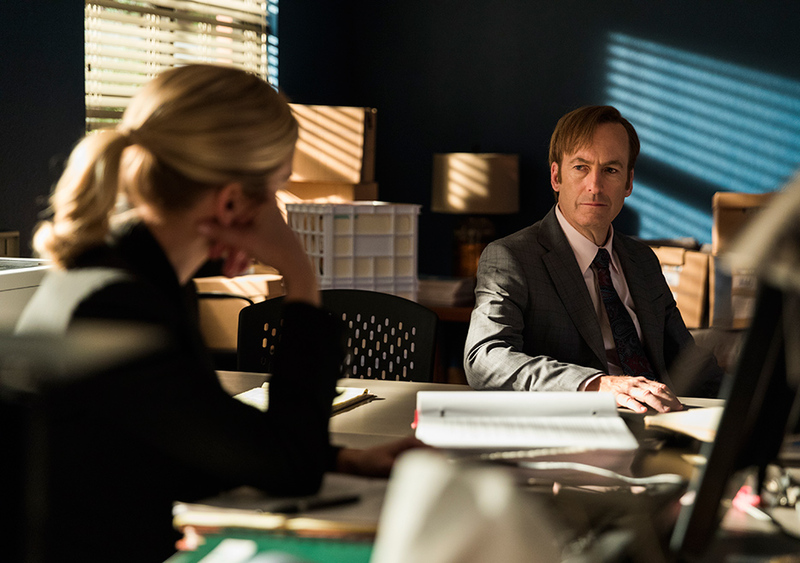 Last season of Better Call Saul ended with several unanswered questions, and a huge promise that appeared in the form of an anagram made from the first letters of each episode’s name: S, C, A, G, R, B, I, F, N, K, when rearranged, spells “Fring’s Back.” Now, of course, Gus Fring did not show up by the end of the season, but there were pretty clear implications that he was wandering around, just out of sight of the cameras. So, does he show up in tonight’s Season 3 Premiere? Scroll down past the spoiler warning to see what happened in this week’s episode. So, in short, no – Gus does not yet show up. But it’s likely coming in the next episode. But before we get to thoughts on Gus, we begin the episode with another flash-forward to “Gene” working at the Cinnabon in Omaha, Nebraska. This one’s a bit more extended than we’ve had before, and we see Jimmy/Saul/Gene going through the banal motions of his boring existence. After working through the morning, he heads off on his lunch break. The close-up on Jimmy’s face as he slowly goes up an escalator, no emotion whatsoever showing, is a perfect metaphor with his situation now. He doesn’t even have the motivation to run a treadmill – his existence is a never-ending escalator to nowhere. He sits on a nondescript bench to eat a nondescript sandwich, reading a tattered paperback copy of The Moon’s a Balloon, David Niven’s first memoir (it’s actually a very interesting read, and is followed up by his later memoir, Bring on the Empty Horses). The book, about a glamorous life in a glamorous time, serves only to emphasize how dull Jimmy’s life has become. However, this dull routine gets a bit of a shakeup. A young shoplifter – we know this is the case due to the DVD case that falls out of his jacket – ends up cornered by police and security near Jimmy’s bench. He hides in a nearby photo booth. The cop walks around, and engages Jimmy. 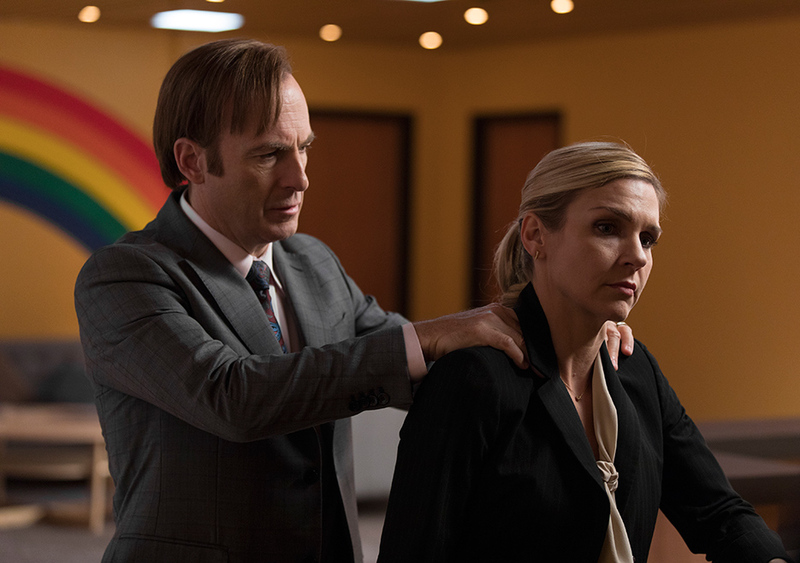 He’s very uncomfortable – he doesn’t know if the cops are looking for Saul Goodman at this point. He hesitates a bit, before silently lifting a finger and pointing at the booth. The cop and security arrest the boy, but as they’re walking away, Gene’s facade cracks for just one moment. He stands suddenly and shouts, “Say nothing! You understand? Get a lawyer.” The security guy calls him a jerk, and things fade back into normalcy. Gene returns to work, but moments after arriving, he passes out and falls to the floor. Jimmy/Saul/Gene has never been the most courageous of people, and this appears to me to be a reaction to his sudden show of bravery. He took a big chance – draw attention to yourself in such a public manner, and you never know who might go digging into your past. What if the cop comes to check him out later, angry that his momentary snitch turned on him? How strong is his backstory, his identity as Gene? Despite this being secondary to the main events of BCS, I’m intrigued to see where Gilligan and Gould take this subplot. Back in Arizona, the episode picks up exactly where it left off. 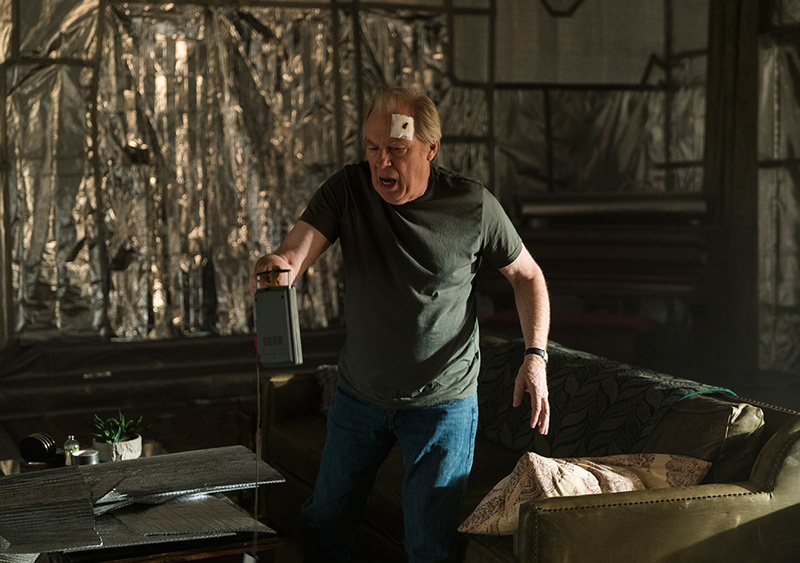 Jimmy comes back into Chuck’s study to help him remove the foil from the walls and ceiling, just after Chuck has hidden away the tape recorder with Jimmy’s admission over the changed Mesa Verde addresses. They have a moment of connection over a book Jimmy finds – The Adventures of Mabel, whence the episode title comes. Jimmy remembers his mother reading it to him as a child, but Chuck reminds him that it was he that read it to Jimmy. Jimmy reminisces about the story a bit, but Chuck shakes him out of his revery – “Don’t think I’m going to forget” he warns his younger brother. Later, it becomes quite clear that Chuck set the whole thing up, and is playing Jimmy like a virtuoso. In a later scene, Howard Hamlin listens to the tape, and his reaction to Chuck is telling. He points out to Chuck that there’s really no point to having made the tape: it’s not going to get them the Mesa Verde account back, it won’t hold up in court, and it’s unlikely anyone’s going to either believe it or care about it in any case. There is, in a nutshell, no one to play it for. But Chuck smiles and tells Hamlin that there’s one person he can think of – and then we cut from the scene. Later, Ernesto comes from the firm to bring supplies. Chuck asks him to change the batteries in his tape recorder, and when he does, it conveniently is set to play right at the moment of Jimmy’s confession. Just a little too convenient, methinks. Chuck basically threatens Ernesto into silence, but it all appears a little for show to me. Okay, so, we ended last season on a cliffhanger, but now it appears that Gilligan and Gould want to stretch out our discovery this season as well. The final scene with Chuck last year was ominous, as he listened to the tape and then hid it and the recorder before Jimmy could come back. He clearly has an ax to grind with regard to his brother, but it’s still unclear what exactly it is. Does he blame him for some long-past ill? It appears so, and the gradual reveals (tonight’s revelation that Chuck was a part of Jimmy’s upbringing, and that Jimmy seems to have forgotten this) are tantalizing, yet teasing at the same time. More, please, Vince! This theme of stringing out the cliffhangers extends to Mike’s subplot as well. We pick up with him finding the “DON’T” note on his car. He checks everywhere for a transmitter, and then goes to a junkyard to check more thoroughly. He literally tears his car apart over several hours, before packing it in. As he sits in the office waiting for a cab, he notices a rack of gas caps. He goes back outside, pops open the inner lining of the cap, and then looks grim – the grimness of a man who has spent several hours tearing his vehicle apart when all he needed to do was to pop open one small seal. He goes home and finds that there is a transmitter in his Caprice’s gas cap as well. He sets in motion an elaborate plan. Contacting his weapons guy (the veterinarian that passes him occasional work), he asks him to acquire a transmitter, one the same as the one being used to track him. It costs him $1000, but he pays the price. Once he gets it, he replaces the one in his gas cap with his own device, and then drains the battery of the original by shunting in a transistor radio to use the energy as well. The battery gets weak, and later a car shows up in the early morning hours. The gas cap is removed, another put in its place, and the car leaves…carrying Mike’s transmitter. He follows at a distance – but we never get a good look at the person keeping tabs on him. Another cliffhanger left dangling. The third subplot is Jimmy and Kim’s burgeoning practice. She meets with her friend Paige at Mesa Verde to go over the files, and Paige is more than impressed at the work Kim has put together in only three days. Kim is still unhappy – she suspects Jimmy’s hand in getting her the account – but she refuses to do anything but her best. 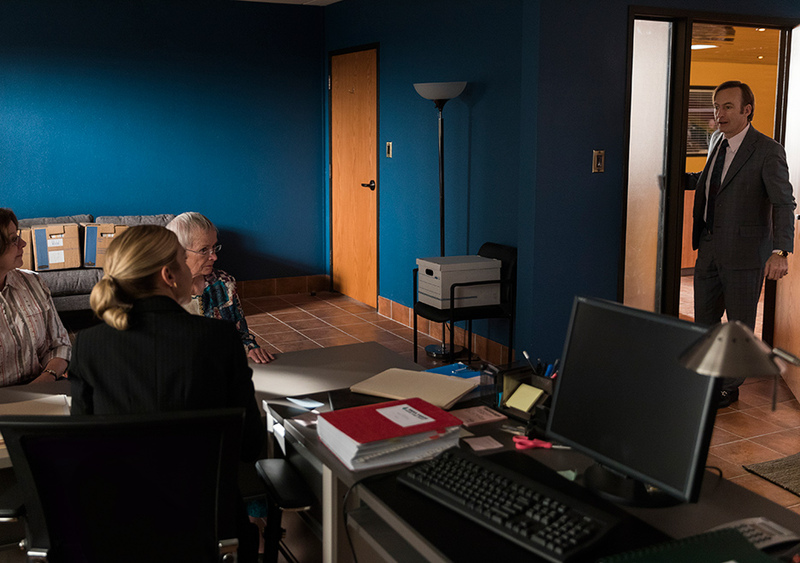 In the office, covering for Jimmy as he helps out Chuck, she’s seen eight clients coming in for wills that were supposed to see Jimmy. Two elect to use her, the other six going (the older set he’s been dealing with are still pretty loyal to Jimmy, it would seem). There’s a humorous moment when one of the clients, there with her daughter, is concerned that her garden isn’t mentioned in the will. Kim explains that it’s included as part of her backyard, but the client is insistent – she’s worried that someone else will take it. Kim agrees to add it to the language. Then, the woman asks if she can also mention the lily pond that’s in the garden. One suspects that, if we stayed in the room, we’d hear her asking Kim to mention individual lilies or perhaps a frog or two as well. When Jimmy gets back from Chuck’s, there’s some tension between he and Kim as she points out that they’re not partners, so she’s taking the accounts of those she’s helped. But that isn’t what’s bothering Jimmy; instead, he’s feeling sad over his talk with his brother. As he tells Kim, “Chuck didn’t hate me for about ten minutes” while he was there – something that hasn’t happened for so long, he’d forgotten what it felt like. Later, Jimmy’s in the midst of a busy day, trying to gently usher a lonely and talkative client out the door. When he turns to ask the crowded waiting room who’s next, he’s surprised to see Captain Bauer there. They go into Jimmy’s office, where the Captain lays into him about lying to him to get on the base when Jimmy was filming his commercial last season. He threatens to go public with Jimmy’s lies of he won’t pull the ad. 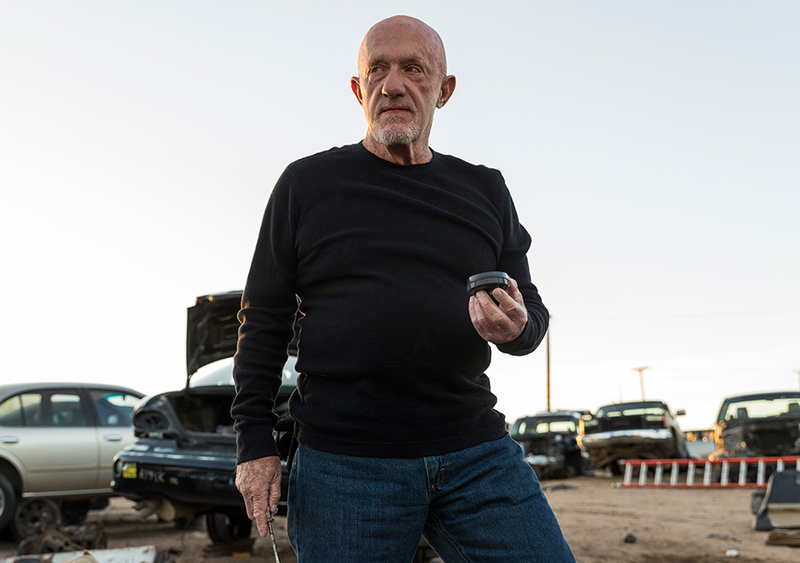 Something seems to click in Jimmy’s mind – another flash of Saul. “Make me,” he says. He asks Bauer, “You like being an Air Force captain, huh? The United States wants to bring action against an old man in a wheelchair?” “He was standing,” Bauer protests, and Jimmy replies, “Yeah, well, periodically he is, and when he shows up in court, you better believe he’ll be in a wheelchair.” Bauer calls him an ambulance chaser, and Jimmy turns back, frustration all over his face, “Always on the high horse, always trying to make me feel like…” He catches himself, and looks surprised. He’s not talking about Bauer at all – he’s talking about Chuck. He calms, and suggests that he won’t fly any jet planes, if Bauer will stay out of court. Bauer realizes he’s not going to win, but he warns Jimmy as he goes to leave: “Guys like you think you’re so damned smart, and you think you don’t have to play straight with anybody. The wheel is going to turn. It always does.” Jimmy’s silence and inability to look Bauer in the eye says it all – he knows that the young captain is right. Overall, a strong opening episode. 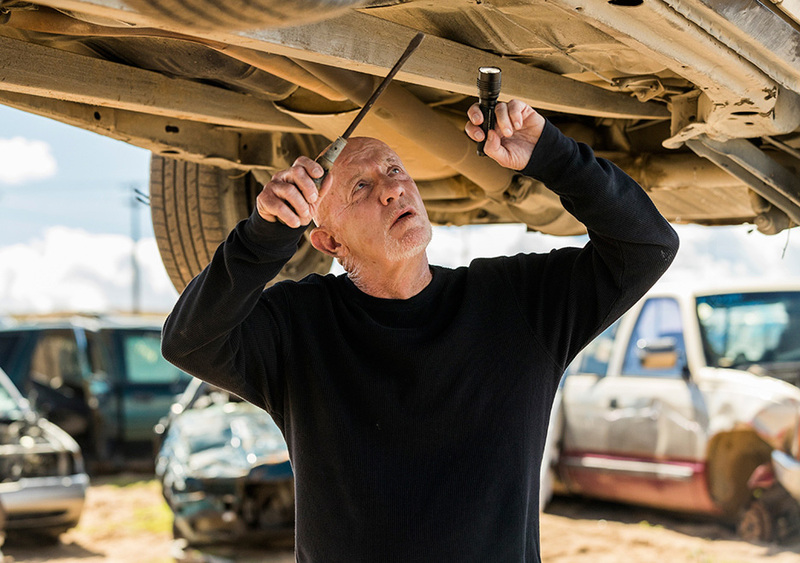 It has many of the quirks and directing choices that Gilligan perfected over five seasons of Breaking Bad, and now two plus seasons of Saul. Little things, like the long shots on seemingly ordinary objects, or the sped up movement of ordinary events, or even the subtle switch from an empty to a full bowl of pimento shells as Mike waits to scout out his stalker, lend an aesthetic to the visuals and pacing that is unique to Gilligan’s work. The background music is, as always, spot on (I especially enjoyed the use of Nancy Sinatra singing “Sugar Town” in the opening black and white sequence), and the little details are never neglected. On a related note, the In Memoriam at the end of the episode was for Eric Justen, who was a sound mixer both on Saul and on Breaking Bad. Sadly, he died of a heart attack last summer, and the production staff wanted to honor him. Tonight’s pacing was slow, but that’s just how each season has started out so far in BCS‘s short life. Start with the slow burn, build to a crescendo, and then set up the next season before hiatus. While I would have liked to see either of the two (three, if you count Jimmy’s relationship with Kim and the likelihood she’ll discover his malfeasance) cliffhangers resolved, I don’t mind waiting another week to see Mike meet Gus, and I’m more than willing to let Chuck unravel his Machiavellian plot one step at at time. Am I alone in suspecting that he’s going to end up wrapped up in his own web at some point? He knows he’s smart, but he doesn’t give Jimmy the credit he deserves. 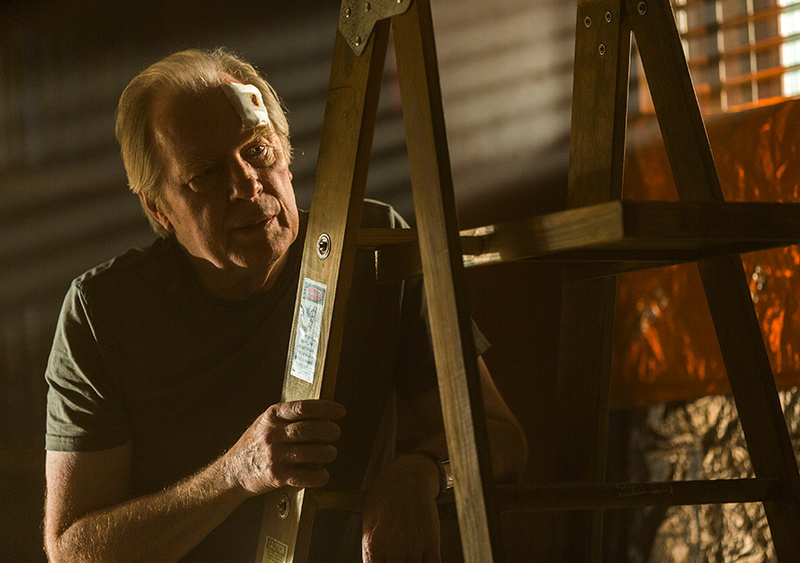 Chuck may only be the second smartest McGill in Albuquerque. A solid opener that provides more questions than answers, but suggests another Gilligan/Gould slow burn to the end.